The hand cane examples shown here are the most common patterns seen. There are more examples on file for those that want something different for a special chair design or part of a room theme / interior design. Hand cane can be recognized easily by looking at the underside of the chair where the cane is woven through holes in the seat frame creating loops. On the topside, (as seen here) the binder around the border is attached in place creating a 'stitched' effect. With blind caning, (sometimes called pegged) the holes are not drilled completely through giving a smooth look on the back of the chair. The front (or top) still has a binder or pegs. Pegged cane- not all hand caning has a 'binder' around the edge; the holes can just be 'pegged'. There are also other styles of 'binder' if you choose to do a little customizing. 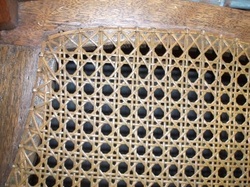 French caning- (also referred to as blind or pegged) uses holes drilled part part way through the frame. A french cane generally uses two sizes of cane: the 'box' made of narrow cane and the 'diagonals' are wider creating a hole that is more diamond than octagon. 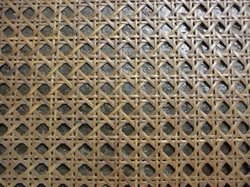 Machine cane (also pre-woven or sheet cane) has a very smooth border. The cane is pushed into a groove and held in place with a 'spline' much like screening in a door. The cane comes in many patterns and sizes. 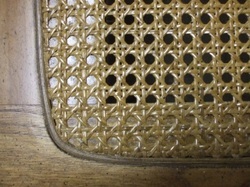 Circular weave (includes spider weave) is seen when there is a medallion in the center of the cane creating a circular weave. 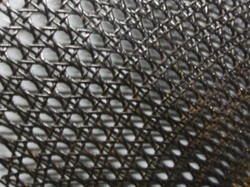 Medallions can be found in machine caning too, but the cane pattern will not run circular. 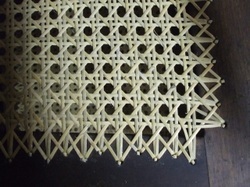 This hexagonal pattern that when seen, is usually found in wicker chair backs. 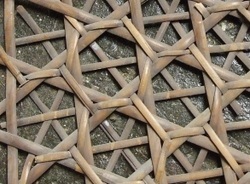 Various sizes of cane and angles creates a 'layered' effect to the caning. Complex and beautiful. There are other versions. Chair cane is the outside bark of rattan which grows in Eastern tropical areas. The outer bark (cane) is stripped off leaving the inside core which is generally called reed. The outer bark is cut into various widths for usage in cane seating or for wrapping and lashing other materials together. The inner core is processed to make different shapes (round, flat, oval, etc.) for use in basketry, seating and wicker furniture. There are many variations of caning, so if you are unsure, contact us. The material is also available if you wish to do it yourself.